Leather pants scare people so much! Don't get me wrong. I was right there with everyone else. 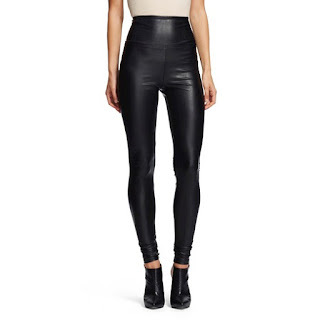 I thought how to wear leather pants as a stay at home mom was the ultimate question. I thought I would feel so silly in them and would never feel comfortable. 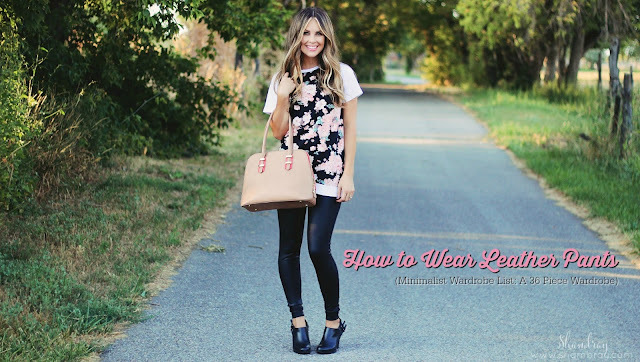 I had no idea that really they are so simple to style! You can wear them with nearly everything and they add a different texture to your outfit. I get so many compliments on them every time I wear them. I am so glad I didn't shy away from them. That being said they were nearly the last thing for me to purchase for my 36 piece wardrobe, because I was so scared. That is exactly why I am doing leather pants second in my lineup of posts. I don't want you to be scared. I want you to get some and to rock them! You will love the difference they can make with an outfit. I am going to share different outfit combinations (everything I share will have items that are recommended in the 36 piece wardrobe). Then I will give you my suggestions on where to get your own pair of leather pants. First up is my friend Kami. She is not only beautiful on the outside, but is seriously one of the nicest people you will ever meet. She can make you feel like a million bucks all the time, no matter what. She is amazing. She started blogging many years ago. She has an AWESOME Instagram account that you will want to follow and she also just recently started selling Maskara. You will also want to follow that account. On top of all this she is an amazing mom and wife. She has so many beautiful pictures in her faux leather leggings that I wanted to share them with you! I was not able to get permission from these bloggers so that is why you aren't seeing the pictures. 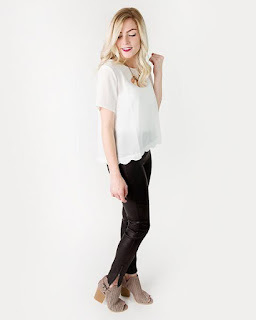 So please click on the links to see the pictures and see how these amazing women styled leather pants in so many awesome ways! These links contain affiliate links which means if you purchase after clicking on the link I will receive a very small commission. I wholeheartedly recommend these stores and commission would never sway me to recommend something I could not stand behind. I got mine from Cents of Style. These are not them, but are so cute and VERY affordable. Honestly if you are looking for a good deal then this is a great place to start and search for leather in the search bar to see if anything comes up. I check out Jane and Groopdealz at the same time. I love both of them! Target is awesome especially if you shop there or online there often. I hope this post helped push you off the fence if you were on it to start with. I promise you that you will like the added touch that these pants will give your wardrobe. If you are only going to have 36 pieces in your closet then you should make sure to keep it interesting and not boring!